The thin line between love and hate was obliterated in the late 1980s by Peter J. Haskett and Raymond Huffman, two alcoholic pensioners sharing an apartment in San Francisco's Lower Haight district. This would be of little consequence to our world if not for their neighbors, a pair of young punks calling themselves Eddie Lee Sausage and Mitchell D. who heard Pete and Ray's drunken bickering through their eggshell-thin walls and began surreptitiously recording their absurd banter. 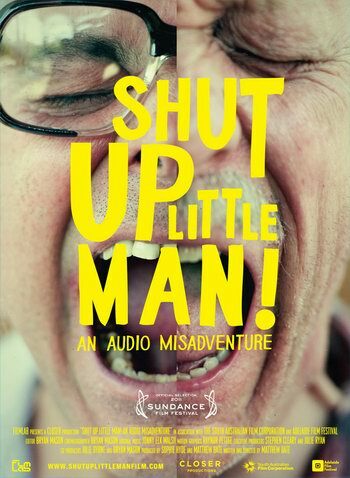 The Australian-produced documentary Shut Up Little Man! : An Audio Misadventure chronicles how Eddie and Mitch's audio vérité project quickly took on a life of its own in underground comedy circles, then blossoms into an unexpected examination on the ethics of entertainment and the very definition of art. 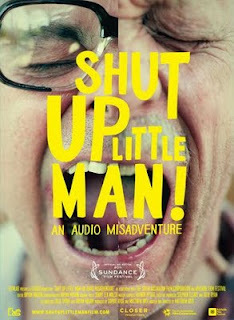 Shut Up Little Man also illustrates how a prank is all about perspective. The film catches up with Eddie and Mitch in the present day, and while they reminisce fondly about sleepless nights recording the verbal warfare next door, they keep a small yet perceptible distance from each other. The popularity of the recordings created a cottage industry of Peter and Ray, and the fallout was surprisingly tumultuous. Mail-order tapes, magazine articles, tribute comics, and eventually a stage play are developed from the raw audio footage. Competing movie projects are launched. Egos are bruised. At one point, a rival playwright echoes one of Ray's hateful screeds when he claims that Eddie is "not a decent human being," the irony resting thick like early morning fog over the Bay Bridge. Funny how a youthful lark can quickly turn into serious grown-up business. Even juicier than all the professional sniping is the investigation into the mysterious nature of Pete and Ray's relationship. Director Matthew Bate cleverly feeds the audience little giblets of information about the famous ex-roommates while he searches for Tony, a mutual friend of Pete and Ray's with similar demons who appears on some of the recordings. This is where Shut Up Little Man may give some pause. Mitch and Eddie don't seem to have any qualms about the exploitative nature of their masterpiece - especially Eddie, who carries it like an artistic burden, tossing around terms like "urban folklore" and making Shut Up Little Man something resembling his life's work. Tony, when finally located, provides a brief jolt of reality as he speaks with candor about his late drinking buddies. They were friendly when sober, or at least functionally co-dependent, and none of them were ever aware of their cultural infamy. You get the feeling that this was for the best, particularly when Tony expresses macabre satisfaction upon hearing of Pete's passing. This is the seamier side of Shut Up Little Man: laying bare the pain, hatred, and despair of two broken men so that the rest of us can have a good laugh. That's not entirely a criticism - there's a weird humanity in Pete's disjointed ramblings and his confidently indignant response to Ray's virulent homophobia (the project's title comes from one of Pete's oft-used bitchy retorts). Bate's film leans toward reverence for the recordings themselves but takes a more nuanced view of their creators, if you can call them that. He does not spare us the discomfort of watching Mitch and Eddie trying to justify not only why they recorded their neighbors' private conversations, but also why they are still so proud of it after all these years. Indeed, the film's great unspoken revelation is that this experience has finally exposed all the unflattering baggage of their lives, too. Can you imagine if they had been able to film their version of Shut Up Little Man? Would we get any sense of Pete and Ray beyond the two angry men on the tapes? Thank goodness for this documentary - the real life story is much more compelling.